A Mesozoic Mystery in Mayo? If rumors of prehistoric saurians lurking in the remote depths of Africa and South America may seem at least possible, than stories of a dinosaur running about on an island off the coast of Mayo county would be bit much for even Sir Conan Doyle's imagination. Nonetheless during the early 1960s, aside from the usual gathering of holiday tourists, the mist shrouded mountains and dense forests of Achill Island were playing host to a visitor seemingly "out of this world." In a strange saga that became headlines for newspapers across the country, the locals of Achill Island found themselves in the midst of an unforgettable mystery. While a scientific bureau was busy searching for a plesiosaur in Loch Ness, some islanders were claiming Achill had its own fugitive from the Age of Reptiles. Achill Island holds a reputation as popular summer retreat with its picturesque mountains and beautiful beaches. But during the 1960s this western island became known for something else: an amphibious monster. Stories and sightings of strange creatures were up to this point by no means anything new to Ireland but until then there was little in regards to "hard evidence". At least, that is, until a Dundalk businessman brought forth a startling Polaroid which for some was hailed as proof that Achill Island was home to nothing less than a living dinosaur. This would become one of the most interesting (and suspicious) episodes amongst the ongoing saga of Irish Lake Monsters. The majority of cases reviewed so far tend to involve a single sighting standing over pre-modern traditions of past (if not legendary) encounters. With Achill however, we have what's sometimes referred to as a "flap" or a series of proximal reports within a short span of time. News of a strange beast haunting the outskirts of Achill Sound created a decent amount of excitement for the townsfolk. Some of whom would find the names of friends and relatives becoming echoed in papers across the country. Much of the attention was no doubt due in part to an anonymous photograph that made front-page news. On the front page of the June 4, 1968 issue of the Evening Herald, a bold headline asks "Camera shot of lake monster?" A Dundalk businessman, on holidays in the Achill area at the weekend, took this picture. Did he catch the monster with his camera? He used a Polaroid camera and this is an untouched reproduction of the picture. The man who took the picture said that yesterday he saw the huge 40 ft. long monster on the side of the lake about 100 yards away and snapped it with his camera. He later showed the picture of the weird animal -said to resemble a dinosaur- to local people who had never before had any real proof of the existence of the monster. The visitor who wished to remain anonymous, was driving on the main road past the lake. Near Mulrany, 10 miles away he had given a lift to two girls from Mullingar. As they were passing the lake one of the girls drew the drivers' attention to the huge animal on the side of the lake about 100 yards away. "Despite advice by the girls I immediately stopped the car and took a picture of the animal, and drove off again in a hurry," he said. "The animal seemed to be about 40 feet long with a head like a greyhound and a long tail," he added. "When I mentioned the strange animal at my hotel the developed photograph became the center of attraction and I discovered that I had stumbled on something important and proof of something Achill people had been looking for." The girls, Mary O'Neill and Florence Connaire (the article does not include full names so I'm lost as to where or by whom they were obtained), were in the businessman's car driving along the road when one spotted the beast ON SHORE. The girls were not frightened only wished to move on but the driver waited to take the photograph. In a much different account the girls, now a Mary Callaghan and Bernie Sweeny, were returning from a dance in Keel late one night when they were offered a ride. Right as they were about to enter the car Bernie noticed a black shiny object swimming in the moonlight. She screamed and in a state of fright ran down the road away from the car leaving Mary and the driver clueless. When Bernie finally pointed to the lake the motorist only saw a rippling ring on the surface. In what appears to be a sensationalized variation for the previous one, Bernie's fright is the result of a big, shiny, black monster running towards her. She takes off fleeing down the road leaving a shaken Mary pointing at the lough. The driver only sees something quickly disappearing into the water. "It looked just like a dinosaur. It moved a bit and I would say it was about 20 feet long." Combining the statements of the driver and these two brief sentences of "Mary," we're only able to gather that the 'monster' was huge, it looked like a dinosaur, with a greyhound's head, a long tail, and it was somewhere between 20 and 40 feet. During a visit to the National Library in Dublin I was able to view the photograph on microfilm. Though still hazy, certain features were discernable that only became lost in replication. Thus my judgment of the picture is from having had the advantage of viewing a more distinguishable image. Naturally any photograph of such nature is going to be perceived skeptically but even looking at the picture with an open mind there are several red flags that stand out immediately. Most evident is the strong likeness the head has to the shape of a classic plastic dinosaur toy complete with trademark gaping jaws. If we forgive the artificial likeness then there is still one very big problem: the size. The figure appears to be standing above the lake which would place the beast in a stature compatible with Godzilla. As the majority of the lough is in view then the head by itself would have to be at least 20 feet long. Further incriminating is the ever-so-convenient pyramided "bush" concealing every part of the gargantuan beast except his T-Rex head. (At least I assume it's a bush but at the time of its publication there seemed to be an understanding that it was actually the creature's back.) The figure is most likely a modified toy dinosaur suspended in the foreground yet staged so as to appear as a giant in the background. The picture almost definitely a hoax and a bad one at that. The photograph and its accompanying story may be fraudulent but there's no reason why that should damage the credence of other reports. 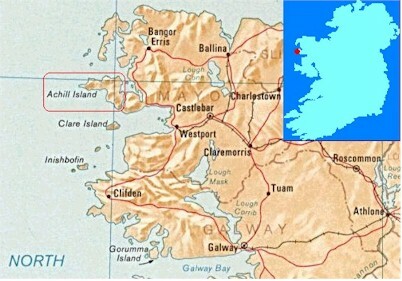 Most notable being a land sighting by John Cooney who was reputed as a sober, honest and trustworthy individual as claimed by the local parish priest and fellow townsfolk who vouched for his sincerity. 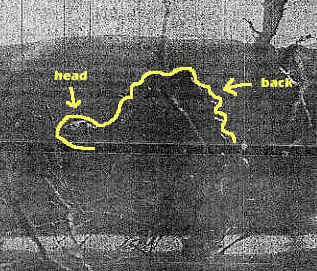 According to Cooney, two months prior to the businessman's alleged sighting he had been driving alongside the lough with his friend Michael McNulty when a creature seemingly "out of this world" passed in front of their vehicle. Described as 8-12 feet long and about 2 1/2 feet tall, the animal bore a long thick tail with a head like a greyhound or sheep on top of a long swan-like neck. The observation took place at night with the animal illuminated by the van's headlights before it disappeared into the vegetation. Two months ago a local part-time decorator, Mr. John Cooney (40), of Achill Sound, was passing in a car on the main road near the lake at twilight when a large animal, similar to the one described by the Dundalk visitor, crossed the road in front of him-going towards the lake. He drew the attention of another man in the car to the animal but they were too scared to pull up. Mr. Cooney related: "I found it hard to convince people in Achill that I had seen this strange animal which had looked like a type of dinosaur. Now I am glad that the visitor has seen the animal, and can produce proof of it. A Keel resident said: "The Dundalk visitor showed me the picture which was only four inches, by three inches in size. I could clearly see the animal in the picture and with the aid of a magnifying glass the animal looked to be over 40 feet long. I would not believe it only for the picture." A local newsagent, Mr. Denis McGowan, Achill Sound, said: "Two years ago a British angler came into my shop in a frightened condition and told me he had seen some strange animal in the lake while fishing there and that he immediately packed up his gear and ran away." Sightings of the creature in water were reported but only one offered any details. An English angler was fishing off the shore of Sraheens Lough when the calm surface of the lake began to boil and from it emerged a long neck with a small head. With a black shiny body in trail, the creature swam towards the fisherman at great speed. The man reportedly discarded his gear and ran all the way to Achill Sound. Cooney and McNulty weren't the only ones to walk away with sighting of the animal on land. Three weeks prior to the photograph, while cycling home from Mass 16 year old Gay Denver spotted an odd creature along some trees 50 yards from the lake as it climbed up a turf bank near the woods. "When I stopped and looked through an opening in the rhododendrons, I had a shock. Crawling out of the water came the strangest animal I have ever seen. It was much bigger than a horse, black in colour with a long, slender and sheep-looking head, long neck and tail. It moved like a kangaroo and its hind legs were bigger than the front ones. When the nasty-looking thing entered the beach, I left the area as fast as I could." Denver felt the photograph properly represented his monster which possessed, "a humped, bumpy back just like that, and a small head." Apparently, what appears to be a "bush" had been interpreted by Denver as the animal's back. If this is what the photographer was intending for his "dinosaur", then the figure looks as though it were trying to represent the sail-finned Dimetrodon or a bizarre misassembled Stegosaurus. Either way, some sort of quadruped dinosaur with a large arching back. However the photo does not show any sort of long neck as mentioned by Gary Denver and John Cooney. In 1975 Jan Sundberg of GUST fame visited Achill as an independent journalist. John Cooney described his encounter to Sundberg and offered a sketch displaying a slender bipedal dinosaur-like creature. Sundberg spoke to several locals who acknowledged there had always been a strong traditions of a sort of monster existing within the region. Cooney's drawing was presented to Dr. Carl Pleijel of the Swedish Natural Museum who was at first uninformed as to its significance. Dr. Pleijel identified the creature in the sketch as a Coelophysis, an early Jurassic carnivore who's size and description to some extent matched that of Cooney's animal. Dr. Heuvelmans felt the comparison was noteworthy enough to spot mention in his Les derniers dragons d'Afrique (Paris: Plon, 1978). Dinosaur or not, the general descriptions surrounding the Achill creature were certainly unique from the more traditional configurations affiliated with Irish water monsters. A rough photo taken during a visit to Sraheens Lough, Achill Island in Fall of 1998. In order to capture the entire lake in one shot I tried climbing the mountain spine situated behind the lake. By the time I'd reached a height where the majority of the lake was visible in a single shot, darkness had fallen. What to Make of Achill? Achill Island had carried previous references to strange water creatures even before the excitement stirred during the early 1960s. 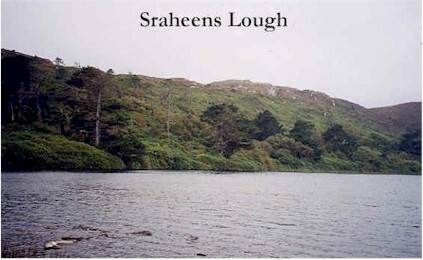 In the 1930s Sraheens Lough was reputed as the home of a "water-horse" and even before then strange creatures had been sighted on rare occasions though few details have survived to present times. A water-horse may very well have been responsible for the flap except that some sightings claim the beast had a long swan shaped neck; a feature foreign to Each'Usiage. 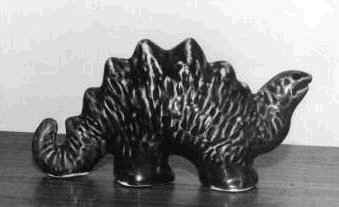 The "dinosaur" theme attached to the phenomena appeared to be present prior to the photograph's publication. I'm inclined to suspect that the Dundalk visitor had heard the stories circulating about the monster and its "dinosaur-like" resemblance and then went about producing the phony image, perhaps originally as a mere joke. The outline of the monster seen on the photograph soon became a sort of indirect local mascot inspiring handcrafts and souvenirs. The Achill Monster managed to remain an issue for years to come. Sometime during the 1970s a group of foreign students did an examination of the lake and supposedly found strange tracks along the shoreline. And somewhere along the line it was claimed that local farmers were mysteriously losing sheep. Whether either of these alleged instances has any correlation with the supposed presence of a water monster is left to the imagination. During a visit to Achill Island in winter of 1998 I was informed that at sometime in the early or mid-80s a hoax was conducted regarding an alleged 'monster' on the island. The culprits responsible for this bogus claim were actually said to be members of the Tourist Board who were willing to embrace some rather unorthodox strategies to attract visitors. The plan backfired, I'm told, as parents complained of frightened children. The same instigators would later try another ploy claiming gold had been discovered on the island and even go as far as to stage a mock debate over the radio arguing for and against mining. On a final note: research colleague Gary Cunningham has uncovered references to Achill Island being home to a very unusual form of otter, possibly the same animal as the Dobhar-Chú. Could it be that this elusive creature thought to have gone extinct in the past 300 years was still living along the thick jungles and uninhabited regions of Achill Island?